A terrible crime was committed in the north part of Daviess County in December, 1887, by which a harmless old man was foully murdered, shot down like a dog and left to die alone and unattended. After more than a century, this murder remains unsolved. John Gagan, an eccentric old Irishman, who was divorced from his wife last June, has since then lived alone in a large 12-room residence on his farm near McFall, Mo. Since the separation he has reported that he has been disturbed by the discharge of firearms in the vicinity of his residence at night, and has claimed that his wife and children have been trying to drive him out of the country, but owing to his numerous vagaries not much attention has been paid to what he said. On Friday, about 5 o’clock a.m., the house he occupied and numerous out-buildings were discovered in flames, with the exception of an old smokehouse all were destroyed. The buildings were saturated with coal oil from the outside, and it is believed now that it was the purpose of the incendiary to cremate the old man while he slept. He was awakened, however, in time to escape and saved a few of his household goods, which were moved into the smokehouse, and he announced his intention of remaining there Friday night. The next heard of the old man was the report of his death, and it is not known just when it occurred. At the inquest a married daughter, Mrs. Addie Pearson, testified that she went over to the home to take him some supper, accompanied by Miss Slaughter, and that they found his dead body lying in the path. She returned to her home nearby and sent for a doctor, and an examination showed that he had been shot, the ball entering near his left collarbone and passing nearly through his body severing a large artery and causing almost instant death. A fence about 12 feet from the body doubtless furnished concealment for the assassin. Gagan’s revolver with every chamber loaded was found on his person, which precludes the theory of his suicide. An inquest was held the night of the murder before Squire Heath and the jury brought in a verdict of death from a pistol shot at the hands of an unknown person. The ball was extracted and is said to have been fired from a .38 caliber revolver or rifle at close range. The old man was buried on Sunday from the residence of one of his daughters. Sheriff Cox and Prosecuting Attorney Chapman have been indefatigable in their efforts to discover the perpetrator of the crime and on Monday John Pettit was arrested on suspicion. There was no direct evidence against him but parities in McFall claimed they saw him that day wearing a pair of rubber boots, tracks of this kind being found near where the murderer is supposed to have been concealed, and Pettit’s claimed to have been in Stanberry that day. Pettit was brought here by Sheriff Cox on Tuesday and taken to Pattonsbug on Wednesday where his preliminary examination is being held, before Squire Casebolt, G.A. Chapman prosecuting, and Hicklin & Yates, representing the defense. When the examination closed last night it was the general opinion of those who had listened to the testimony that Pettit was innocent of the murder, although it is very conflicting. 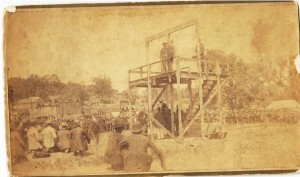 A railroad man testified that he saw Pettit at Conception, west of Stanberry, Friday morning, and he would have had to have walked nine miles to Stanberry to have taken a train for McFall in time to commit the murder. It is not known what may be developed today and the evidence may fasten the crime on somebody. Rumors and charges of all kinds may be heard, but it is not our province to give them credence without any evidence. No human eye witnessed the deed, the victim cannot appear in earthly courts to denounce the assassin, and at present it seems that there is no evidence to fasten the crime on any party, but retribution will surely overtake the guilty one. Gagan had made a will in which all his property was left to the Christian church of Daviess and Gentry county; the will has been offered for probate, but will probably be contested. There was insurance on the property destroyed to the amount of $2,000. One of the institutions of Benton township, and we might say of the county, are the famous Crystal Springs. They are situated on the farm of John Gagan, about five miles northwest of Pattonsbug, on Crystal Springs Branch, a small creek which empties into Sampson Creek, not far distant. There is a beautiful grove of forest trees near the springs, which are three in number, and chemical analysis has shown them to possess wonderful curative properties. The last few years they have become famous, and camping parties, numbering thousands, during the summer months, drink of their healing waters. There is yet but one hotel at the springs, but if another large one was built it would probably be filled for three months. The bed of the creek is mostly dry during the summer months. It has a rocky bottom of limestone formation of a blue cast and very hard. Blue soap stone and soft slate, scaly and easily crumbled, is found near the surface from one to two feet, while at the depth of about three feet a rich clay loam is found. Below this is a soft, dark slate stone, very free, and still further down, slate-stone, hard, and then succeeded by a species of limestone, hard and brittle. The bathhouse is a small building near one of the main springs. The citizens around these springs have known of their great medicinal qualities for years, but they have only been known to the general public for a few years past. In that time, however, they have become famous. Messrs. Wright and Merrill, chemists, of St. Louis, gave the following analysis of the waters of these celebrated springs. Reaction alkaline, specific gravity 1.0021, carbonic acid abundant, carbonate of lime, carbonate of magnesia, carbonate of oxide of iron, sulphate of lime, chloride of sodium, chloride of potassium, silica, organic matters. These are the ingredients of the best mineral healing waters to be found, and theses springs in their great medical properties, have few equals, if any, in the country. They will yet become a great summer resort. Is a native of County Kings, Ireland, born June 24, 1819. His parents, John and Catherine Gagan, emigrated to America and landed in Baltimore county, Maryland, in the year 1835. John lived there till 15 years of age then went to Pennsylvania and worked as a stone-cutter and contractor till 1846. On Nov. 1 of that year, he was united in marriage to Miss Sarah D. Williams, a native of Greenup county, Kentucky, born Feb. 17, 1826. She was a daughter of Lewis and Roxie Williams. Her father was born in Kentucky, and her mother in Virginia; the former died in 1834 and the latter in 1868. After their marriage they lived in Kentucky for three years then moved to Daviess county and located upon the farm they now occupy. Six children have been born to them; namely, Mary, Ellen, Cornelius F., John, Adelaide, Benjamin F. and Rosa A. Mr. Gagan, by his industry and thrift, has succeeded well and is now the owner of 300 acres of fine land all improved and well stocked. His home farm of 200 acres is a very valuable one; upon it are located the famous Crystal Springs. There are quite a number of these springs and they are said to possess many curative properties, and during the summer season they are visited by many invalids. He has enlarged his residence and made arrangements to accommodate the many who make his place a summer resort. Mr. Gagan had but little opportunity of attending school in his younger days, but by diligent application to good books combined with a natural talent he has become a well informed man. He has a very fine orchard and vineyard and is acknowledged the champion wine-maker in the county.